"Survival is a word... This is its story!" B.B. King: Life Of Riley is an autobiography film that was released in 2014. 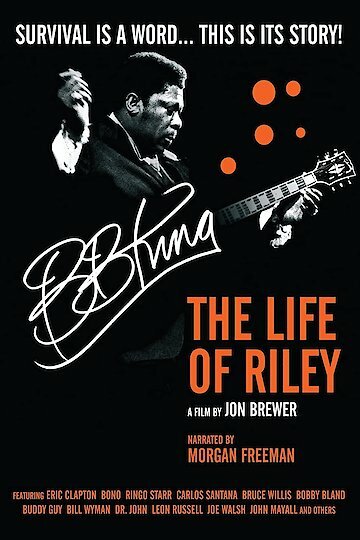 The movie is about the great B.B King and his start as a musician. In the movie he talks about his childhood and growing up experiencing a great deal of racism. He also talks about what inspired him to become a musician and his start from the juke joints. Throughout the film, many celebrities and musicians talks about him as a person and as a fellow musician and how he is a legend in the music world. The autobiography film is informative and shows the audiences the living legend- B.B. King at his best. B.B. King: Life Of Riley is currently available to watch and stream, download, buy on demand at Amazon Prime, Fandor, Amazon, iTunes online. Investigation Begins in B.B. King's Death - Was the Musician Poisoned? A murder investigation begins after King's daughters allege he was poisoned.